These are Limited Edition Prints so when they are all sold, no more will be reproduced as Limited Edition prints at this size again, therefore preserving the uniqueness and rarity of the image. All editions will be registered at https://www.tagsmart.com/. This will ensure your print will remain logged and certified for future buyers or sellers as genuine and original. There is no need for a Certificate of Authenticity from Tagsmart, however, you can order one at checkout if you wish. The Image will be personally signed and numbered by Stuart on the reverse of the print by default. If you wish, it can be signed and numbered on the front. Please indicate when ordering. Hahnemüle Pearl has a smooth orange peel texture and a bright neutral white base, it creates really natural black and white images and offers vibrant colour reproduction with great detail. The paper is resin coated with a fibrous feel. The satin finish of the resin coating gives depth to the image which combined with the texture and vibrant colour reproduction. Orders are usually dispatched within 7 working days. Shipping is free for the U.K and Channel Islands but charges will apply to International orders. Prints will be sent in a rigid cardboard tube. The print will be gently rolled in acid free tissue paper within a waterproof bag. The Tagsmart Certificate will be posted separately and may arrive after your print due to registration & printing times via TagSmart. What’s included in your package. Every Certificate has a unique combination of security cuts, part of the web of visible and invisible measures taken to protect against fraud. See the physical details of your artwork in one place, including a statement from the artist about the work. You can access more information about your artwork by scanning the QR reader with a smartphone camera. You will also have the option to personalise your Certificate with your name. 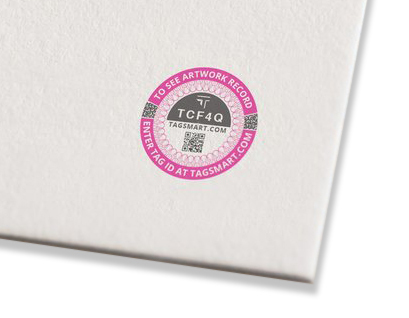 Every Tagsmart Certificate is uniquely signed by the artist who created the work. Certificates of Authenticity are printed on high quality, 270gsm archival paper. A special tagsmart sticker will be placed on the rear of the print which matches the online record.